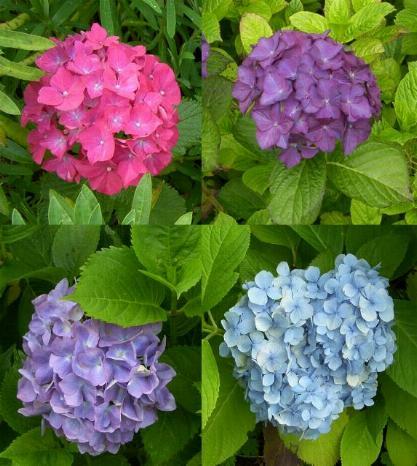 These are the flowers of the 'mop-head' or hortensia varieties of Hydrangea macrophylla with large, domed flowerheads composed mainly of ray florets. The colour is determined by the acidity of the soil, with blues on acid soil and pinks on alkaline soil. The blooms above are all present in my garden which shows how variable conditions can be in different areas. They make very good cut flowers and can be dried as well. The blooms are usually left on the bush over the winter and removed in the spring as the new buds are breaking - this is to give some shelter from frost or cold winds, and any outer buds which have been damaged can be cut out as well. They bloom on the shoots grown the previous year (smooth bark) so prune out older branches (look more wrinkled) close to the base of the bush and these should produce new growth for the following year - remove about a third and any dead branches.